One of our favorite topics and most frequently asked questions. Our answer? 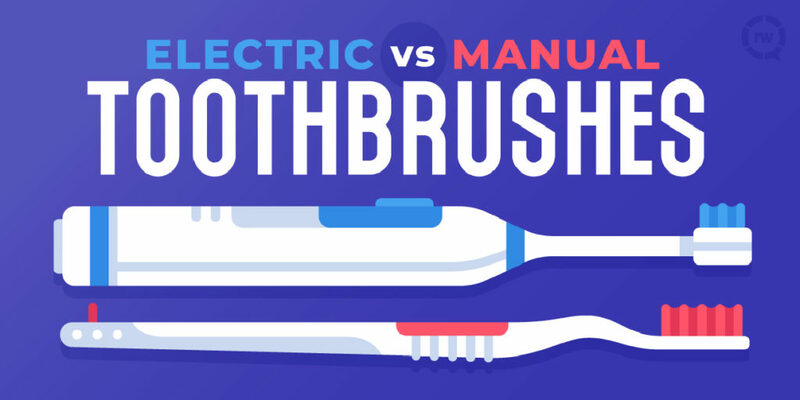 Though we tend to lean toward electric, the reality is it’s not the brush that matters as much as who is doing the brushing. Let’s break that down. The goal of tooth brushing is to remove plaque from your teeth on a daily basis, so that you prevent the buildup of tartar that leads to tooth decay. A manual toothbrush is a great and inexpensive tool that helps you do just that. Make sure to brush two minutes per day, twice a day. Gently brush ALL surfaces and make sure to reach those back molars. The same tooth brushing rules apply – two times per day, two minutes at a time. One advantage of an electric toothbrush–we recommend the Sonicare Essence Rechargeable Toothbrush–is that some have a built-in timer. If you’re one of those quick brushers who has a hard time making it to two minutes, consider using a timed electric brush. At your next visit, ask us whether we think you would do better with a manual or electric brush. And, as always, don’t forget to floss!